This is not a swimming lake. Burnaby Lake is a lake with lily pads and lots of birds. This 300 hectare park has a 2.5 mile trail around the lake, squirrels, beavers, lots of geese and ducks, and other waterfowl. At the end of Piper Avenue is a nature house and bird watching tower. There's a dam at the eastern end of the lake from which the Brunette River flows to the Fraser River. The dam is used to regulate the level of the lake during times of heavy rainfall. In 1858, having heard the local Native Indians talk of a fresh water lake north of New Westminster, Colonel Moody of the Royal Engineers send out a search party to find the lake. 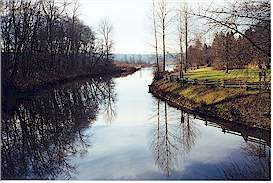 Moody named Burnaby Lake after his aide and secretary, Robert Burnaby. Also visit nearby Deer Lake, and the Burnaby Village Museum.